Mother’s Day is upon us and while we’re all hoping for breakfast in bed and a nice lie in, some family time would be nice too. Sleep ins don’t exist in my house – unless you count lying in bed with three children sat on various parts of your body – but I know the kids would love some of these Mother’s Day events. Aimed at parents who miss their clubbing days, this event is for underground mums and dads – and their kids – who like it old skool style. Organised by a crew of ex-ravers and DJ’s who are now parents, organisers keep the party jumping with free glow sticks, bubble machines, giant balloons, top DJs, dancers and child-safe club lighting. Music will be set to safe levels for little ears and there will be chill out activities such as craft tables, play doh areas, a book corner and face painting. Golden Lion, Todmorden. March 31, 2-4.30pm. Afternoon tea is always a safe bet (caffeine and cake, what’s not to like?) but it’s best to book early if you have a favourite place. 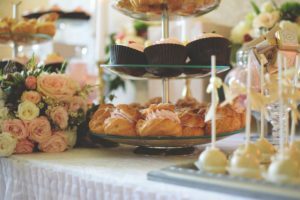 Shibden Mill Inn is doing a special Mother’s Day afternoon tea on Saturday, March 30, while Evokesomm, in The Old Arcade, Halifax, is doing one on Mother’s Day itself (March 31). There are afternoon tea suggestions on the Calderdale Mumbler website, too. If you want to ensure you get a gorgeous Mother’s Day gift, book your little ones onto a workshop at the Jungle Experience in Manor Heath Park. Kids will plant and decorate a beautiful basket of flowers, with spring flowering and foliage plants. It costs £7.40 per basket, with sessions running on Saturday, March 30 at 10am, 11am, 12pm and 1pm. Tickets via TicketSource. Suitable for all ages (children must be accompanied by a parent or carer). Thin gloves may be needed. Who else has got wild, energetic children? Let them burn off their energy with a 90 minute play at Wacky World on Saturday, March 30 at North Bridge Leisure Centre, Halifax. They can have a go at Total Wipeout, Extreme Hungry Hippos, gladiator duals, assault courses and much more. The parent/child sessions are just the ticket for some quality bonding time, and you can reserve your place here. Kids love trains and mums love bargains, making the Mother’s Day “mums travel for half price” deal at Kirklees Light Railway an attractive prospect. The ticket for mum will be valid all day on all trains, so you can have a fun family day out. Only valid on Sunday, March 31. Kirklees Light Railway, Park Mill Way Clayton West, Huddersfield. There are so many lovely free places to enjoy time together outdoors. One of our favourites is St Ives, with woods to explore, a pond to walk around and feed the ducks, wonderful playground and a bird hide. There’s a list of fun places to visit (not all free but all of them wonderful for families) at the end of this blog on getting kids outdoors more. How will you be spending Mother’s Day? We’d love to hear all about it in our Facebook Chat Group, Calderdale Mumbler Chat Group.